Featuring discussions on 'comprehensive liberalism', libertarianism vs liberalism, adaptive family values, and more. Also featuring popular culture talk. TaraElla: Welcome to a new season of the TaraElla Report, where I chat with my friends about cultural and political issues. All of us are individuals who are simply looking for more freedom. I believe that it is only through amplifying the conversations of everyday individuals that we can cut through the nonsense and bring back freedom. Today's conversation is with Ashley, another old friend of mine with whom I have had political conversations going back to our college days. Like myself, Ashley has been all over the political spectrum. Earlier this decade she used to be an SJW, and around the middle of the decade she was an anti-SJW. Today, she identifies as neither, having seen through all of them. She also has a lot to say about how cults of personality can help drive political shifts in a large number of people, and how that can be both good and bad. Ashley: The topic of political evolutions is interesting. I think you are I are not unique in our political evolutions, many people have switched back and forth and in recent years, simply because we couldn't find a good solution for freedom anywhere. During the Bush years many of us hated the religious right and thought the opposite would give us freedom, so we joined the so-called left by default. Many of us continued to go left during the early Obama years, and some of us, myself included, became SJWs. It started out simply as a desire to see less racism and sexism in this world, and to see LGBT people get better treatment in society. I even got involved in Tumblr SJW-ism for a while; trust me, it wasn't so bad in the early days. But around 2014, many of us saw that something was wrong with the SJW way. They were getting increasingly militant and started to threaten free speech. And then there were all these new taboos, like cultural appropriation, rules around pronouns, even the idea that straight white people should speak less, as if this would be justice. Many of us felt like the SJW left was the new threat to freedom, so we became anti-SJW. During those days, anti-SJW leaders like Sargon of Akkad seemed to speak sense. We still had limits though; nobody I knew liked Milo Yiannopoulos and his trolling, for example. And then Jordan Peterson came along and explained so clearly what the problems with the left are, and where they stem from. It was fascinating to understand the history of the so-called New Left and postmodernism. Studying the ideas of Foucault, who thought that mental illness was a social construct, gave me a scare, because if people in the left really believed these things, then they had no sense of reality at all. TaraElla: Yes, some of the ideas of Foucault and the postmodernists are really scary indeed. If you aren't committed to truth, there's no way to be committed to free speech. The justification for free speech rests on the importance of discovering truth. On the other hand, if one is committed to fantasies, one necessarily needs to limit free speech in order for those fantasies to survive. I even suspect that when postmodernists say that speech is power, what they subconsciously fear is the power of truth-speaking to smash false fantasies. Postmodernism is problematic because a society that privileges the survival of fantasies above free speech would be necessarily totalitarian. I think one of the reasons why Jordan Peterson is so popular is because he has made so many people aware of the postmodern problem. This doesn't mean he is right on everything, it merely means he has got us talking about something important. Ashley: I think you're right. I guess in hindsight, a lot of anti-SJW-ism was basically freedom-loving people beginning to see the postmodern worldview and not liking what we saw. When we have the right language to describe the problem, we don't have to resort to saying 'crazy SJW' every time. Besides, social justice is still inherently a good thing, it's the infiltration of thinking of people like Foucault, bell hooks, and several others that's the problem. Another postmodernism-related problem I see is the development of cults, people being committed to personalities rather than truths. Even Jordan Peterson, yes he says a lot of useful things, but there's legitimate concern about the cult-like worship some Peterson fans engage in. Not everything Peterson ever says is always right. One thing I've learned in the last ten years is, even if the SJW is objectively extreme, the anti-SJW is not always right either, and one always needs to hear all sides of each argument. And the development of cults of personality on one side encourages the development of mirroring cults of personality on the other side. For example, there seems to be a cult of personality around a YouTuber called ContraPoints just in the past year or so. Interestingly, this seems to have started with her posting a video about Jordan Peterson, in which she appeared to refute Peterson's arguments, unconvincingly in my opinion. Some ContraPoints fans seem to uphold her as the anti-Peterson, even calling her the 'lobster queen', lobsters being symbolic of Jordan Peterson in some circles. Again, meme culture on both sides contributes strongly to this cult of personality thing. 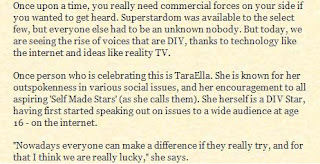 TaraElla: I think we've seen so much of this cult of personality thing, with factions coalescing around particular figures pit against other factions coalescing around other particular figures. We've had SJWs rally around Lena Dunham and Anita Sarkeesian, anti-SJWs rally around Sargon and Milo, IDW intellectuals rally around Jordan Peterson and Sam Harris, and now anti-IDWs, if you can all them that, rally around ContraPoints. No wonder our politics is also going that way, with Hillary Clinton, Bernie Sanders, Donald Trump, Jeremy Corbyn, Boris Johnson and Jacob Rees-Mogg all having cult-like followings, just using American and British examples, I'm sure there are more in other countries. Our politics is all the poorer for this, because people stop debating ideas and start turning the whole show into a popularity contest, like Political Idol. I mean, the 2006 film American Dreamz was supposed to satirize this development, but we've gone up to a whole new level since then. Ashley: You know, I blame meme culture for a large part of this. Memes are good for creating cults of personality, but they are not useful for actually thinking about and discussing serious ideas. Meme-based politics is ultimately empty and even distorted, like squashing a 3D object down into two dimensions, if you know what I mean. I think the emergence of ContraPoints is perhaps the ultimate result of meme culture: a lot of her popular videos have titles based on memes, she references a lot of memes in her videos, and she has been turned into a meme by her fans who call her the 'lobster queen'. Another thing is, the meme-like quality of ContraPoints is further enhanced by fans putting her in some sort of competition with other characters, as seen in her fanbase's recent delight when her subscriptions passed that of another YouTuber she had discussed in the past, Blaire White. There wasn't any actual competition between these two, but many ContraPoints fans imagined there to be a competition, maybe for some sort of YouTube Idol. You know, this is getting unhealthy. 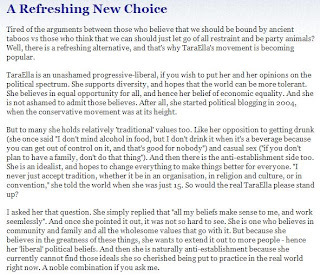 TaraElla: Yes, I agree that we need to get away from the popularity contest mentality, and back to the truth seeking mentality that The Englightment and classical liberalism represents. This is why I discuss ideas from every side of politics and culture here on my show. This is why I don't tend to pick sides in popularity contests. That's all for today. I'll be back next time with another conversation. Subscribe if you want to follow our story. The transcripts are available on my website, and my Medium profile. And remember to resist the hive mind and stay individualistic. The world depends on it.